http://en.wikipedia.org/wiki/Second_National_Bank condensed by JK. JK was looking into the accuracy of the Movie Money Masters, and so visited this site amoung others to verify several claim that he was not aware of. A satire on Andrew Jackson's campaign to destroy the Bank of the United States and its support among state banks. Jackson, Martin Van Buren, and Jack Downing struggle against a snake with heads representing the states. Jackson (on the left) raises a cane marked "Veto" and says, "Biddle thou Monster Avaunt!! avaount I say! or by the Great Eternal I'll cleave thee to the earth, aye thee and thy four and twenty satellites. Matty if thou art true...come on. if thou art false, may the venomous monster turn his dire fang upon thee..." Van Buren: "Well done General, Major Jack Downing, Adams, Clay, well done all. I dislike dissentions beyond every thing, for it often compels a man to play a double part, were it only for his own safety. Policy, policy is my motto, but intrigues I cannot countenance." Downing (dropping his axe): "Now now you nasty varmint, be you imperishable? I swan Gineral that are beats all I reckon, that's the horrible wiper wot wommits wenemous heads I guess..." The largest of the heads is president of the Bank Nicholas Biddle's, which wears a top hat labeled "Penn" (i.e. Pennsylvania) and "$35,000,000." This refers to the re-chartering of the Bank by the Pennsylvania legislature in defiance of the administration's efforts to destroy it. Obviously there is a need for a currency and an orderly way to direct the economy through a structure that would provide the service of today’s financial institutions. However, this role ought to be performed by a government that is free from dependence upon banking and have also have the citizens of the United States meaningfully review their performance of banking based upon the good they do for the masses. This is what we ought to have. What we have is that the national and local banks have a review system consisting of investors measuring performance on the profits generated--a system of greed. The financial institutions are a child of our government and our government is fed by its child--jk. 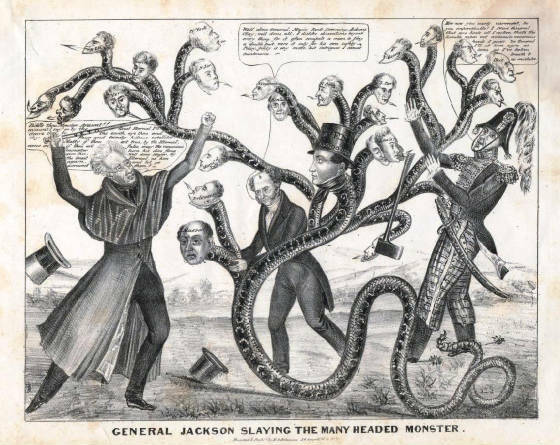 http://en.wikipedia.org/wiki/File:General_Jackson_Slaying_the_Many_Headed_Monster_crop.jpg Jackson slaying the hydra. The First Bank was a bank chartered by the United States Congress on February 25, 1791. The charter was for 20 years. The Bank was created to handle the financial needs and requirements of the central government of the newly formed United States, which had previously been thirteen individual colonies with their own banks, currencies, financial institutions, and policies. Hamilton was a student of both the French finance minister Jacques Necker and his British counterpart Chancellor of the Exchequer Robert Walpole (in addition to his own extensive reading). Hamilton devised a bank for the whole of the country, not just for sections or states. Officially proposed by Alexander Hamilton, Secretary of the Treasury, to the first session of the First Congress in 1790, the concept for the Bank had both its support and origin in and among Northern merchants and more than a few New England state governments. It was, however, eyed with great suspicion by the representatives of the Southern States, whose chief industry, agriculture, did not require centrally concentrated banks, and whose feelings of states' rights and suspicion of Northern motives ran strong …. Secretary of State Thomas Jefferson and Representative James Madison, like most members of Congress opposed Hamilton’s recommendation. Many Americans were concerned that a national bank would result in a "money-monopoly" increasing interest rates and harming the very business interests it was supposed to protect. That the Bank was to be a private company. That the Bank would have a twenty year charter running from 1791 to 1811, after which time it would be up to the Congress to renew or deny renewal of the bank and its charter; however, during that time no other federal bank would be authorized; states, for their part, would be free to charter however many intrastate banks they wished. 1. be forbidden to buy government bonds. 2. have a mandatory rotation of directors. 3. neither issue notes nor incur debts beyond its actual capitalization. That foreigners, whether overseas or residing in the United States, would be allowed to be Bank of the United States stockholders, but would not be allowed to vote. The bank's charter expired in 1811 under President James Madison. The bill to re-charter failed in the House of Representatives by one vote, 65 to 64, on January 24, 1811. It failed in the Senate when Vice President George Clinton broke a tie vote that February 20. In 1816, however, Madison revived it in the form of the Second Bank of the United States. Nicholas Biddle in 1816 was appointed by President Monroe as federal government director of the Second Bank of the United States (hereafter SBUS). Because of tight credit policy instituted in 1819, the SBUS was blamed for the Panic of 1819. In Tennessee, Andrew Jackson was hard-pressed to pay his debts in this period. He developed a lifelong hostility to all banks that were not completely backed by gold or silver. This meant, above all, the Second Bank of the United States. The "Bank War" of 1832–36 was initiated by Biddle when he decided to apply for the Bank's re-charter four years before the charter was scheduled to expire. Until 1832, Jackson, for three years, had ignored the Bank and Biddle. But, once challenged, he decided to veto the bill to re-charter the bank, which was being pushed by Senator Henry Clay of Kentucky in preparation for another Presidential run later that year. Jackson, well-known as a man whom one did not want to anger, still harbored ill will towards Clay from the 1824 Presidential election. Clay's strategy failed, and Jackson gained great support from the public for his veto. Clay lost to Jackson again in November despite massive funding of over $3 million in bankers' support [an early example of the political arm of banking}. Jackson in September 1833 removed federal funds from SBSU--by far their biggest depositor. To fight back, Biddle decided to shrink the money supply and cause a recession in 1834 in order to force Jackson to accept a re-charter bill. The Bank demanded that old loans be repaid. It made no new loans. There was a brief recession in the first half of 1834, but another bill to re-charter failed in the House on April 4. That was the last time the issue ever came before Congress. And so, the Bank was doomed. Its charter expired in April, 1836. In 1839, Biddle resigned from his post of Bank President, and in 1841, the Bank finally failed. Biddle was arrested and charged with fraud; he was later acquitted. He died soon after while still involved in civil suits. The Second Bank of the United States was chartered in 1816, five years after the First Bank of the United States lost its own charter. The SBUS was in no sense a national bank but rather a privately held banking corporation. The bank had a unique relationship with the federal government that gave it access to substantial profits. Its role as the depository of the federal government's revenues made it a political target of banks chartered by the individual states which either objected to … the B.U.S. 's relationship with the central government. The Second Bank of the United States was initially headquartered in Carpenters' Hall, Philadelphia, the same as the First Bank, and had branches throughout the nation. The Second Bank was chartered by many of the same congressmen who in 1811 had refused to renew the charter of the original Bank of the United States. The predominant reason that the Second Bank of the United States was chartered was that in the War of 1812, the U.S. experienced severe inflation and had difficulty in financing military operations. Subsequently, the credit and borrowing status of the United States were at their lowest levels since its founding [not surprising given the role of the Bank of England & that the US was at war with England]. Like the First Bank, the Second Bank was also chartered for 20 years, and also failed to get its charter renewed. It existed for 5 more years as an ordinary bank before going bankrupt in 1841. Financial difficulties following the war including inflation were causal factors that lead Madison and congress to charter the SBUS in 1816. Loose credit policy of the bank in produce a boom in land sales (in 1819 sales totaled 55 million acres) resulted in an economic bubble. By the early 1830s, President Jackson had come to thoroughly dislike the Second Bank of the United States because of its fraud and corruption. Jackson then had an investigation done on the Bank which he said established “beyond question that this great and powerful institution had been actively engaged in attempting to influence the elections of the public officers by means of its money.” [Influence elections is not called a “corruption”, for it is the norm today] Jackson is considered primarily responsible for its demise, seeing it as an instrument of political corruption and a threat to American liberties. In his message regarding his veto, Jackson used language which appeared to resonate mostly with common citizens while attacking the predominantly rich and in many cases foreign stockholders of the current bank.